I’m seriously loving having some help around the house at the moment. My days are numbered, so I’m giving my Dad all those little jobs that have been niggling at me and he and Mama have been absolute champions in the kitchen. Mum and Dad divorced about 500 years ago so it’s really awesome that they are such great friends these days. It makes family events like this so much easier, not to mention enjoyable as they’re a pair of old reprobates. They had great adventures together, my parents. They were avid shoe-string travellers (Dad actually said that makes them sound quite well off!) in their day and have many torrid tales of burglaries in India, illness in Afghanistan and haggling in Morocco. In fact, I’m the very proud owner of a large engraved brass Moroccan table that my Dad haggled for days over when he was really just boy. They’re good company and I wish they were staying longer….Dad will never have time to landscape my entire garden this trip. Balls. 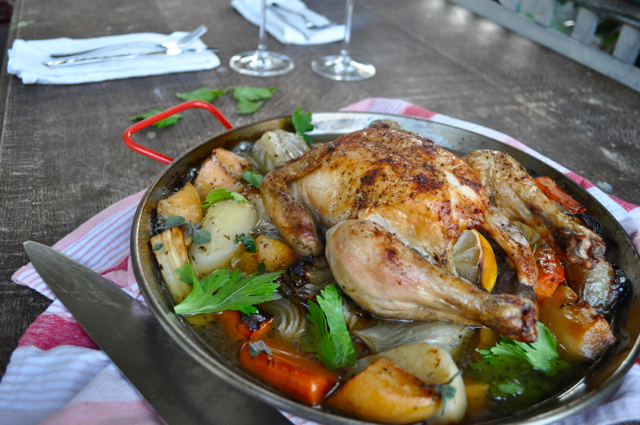 There’s something about a roast chicken that is so very comforting. You can be traditional, or quirky, but when the smell of a roasting chicken fills your home there is something deeply comforting about it. I also really love to turn left-overs into a scrummy chicken pie, but I have a sneaking suspicion that today, with my family at my table, we will not have a single left-over, except perhaps a wish-bone. This recipe rocks as you chuck everything in one tray and all the juicy, chicken goodness permeates the lot and you don’t need gravy as you have a rocking chicken jus. If you make a pie the next day you can add a little flour and thicken that up as your gravy. This calls for all the awesome winter veges. I love a root vegetable, especially when roasted, as it releases all of the sweetness. Give this one a try, it is officially only one tray, but really, you do need a tray of crunchy roast potatoes on the side. You can’t do it any other way. Put your oven onto 180C. Remove the nasty fatty bum bit of the chicken and any giblety bits. Stuff half a lemon in the chooks bum, stuff in some herbs and spread her legs out as if stretching her hips. It helps her to cook nice and evenly. Rub skin with salt and pepper, and sprinkle on a little paprika (mostly for aesthetics, looks count you know!) and drizzle with some olive oil. 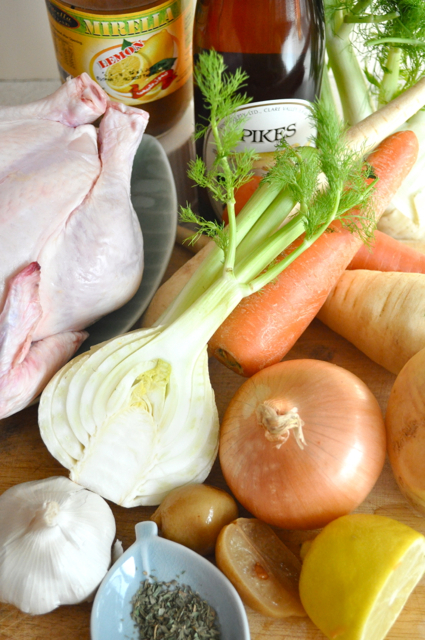 Pop all of your chopped vegetables into a baking tray with a little depth to it and throw in your stock and vino. Add your herbs. Plonk your chicken on top and throw the lot into the oven for about 1.5hrs or until the juice runs clear when you stab her in the thigh. Serve with your roasties and a nice glass of wine………chickeny goodness. Nice! I admit, as much as I like to cook, I am so intimidated with cooking whole chickens. I’ve done it once but I think I prefer the already-cut up pieces 🙁 Still, I think I will make this recipe next week and just substitute the whole chicken for already-cut up pieces. I hope that it still works! I’m sharing this on my Twitter! 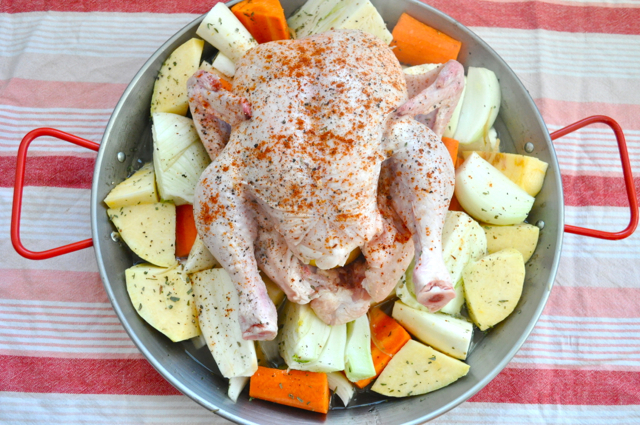 It will totally work with chicken pieces, just reduce cooking time, but I just want to say – don’t fear the whole chicken!! It’s seriously easy, especially in this dish because if you over cook it it won’t dry out because of all the stock in there. The slowest place to cook is the joint where the leg meets the body so make a slice in there when you’re checking readiness, and throw it back in if it’s still pink……try it with pieces first and see how you feel about the flavours first. Let me know how you go!